To say that these are the best gluten-free pancakes I’ve ever had would be selling this stack short. I hesitate to ever make claims that something is “the best,” because taste is so subjective after all. But these (in my opinion) have to be right up there with the best pancakes I’ve ever eaten, gluten-free or not. “That flour” I used is Pamela’s Baking & Pancake Mix. I originally started using their flours because all of my gluten-free friends had recommended it to me. This baking mix worked perfectly in these muffins, but I have to say – pancakes with it really take the cake. The way I feel about gluten-free baking is that it’s easier to buy one great mix than to try to combine 4 (or more!) types of flour. The folks at Pamela’s have worked out all of the ratios for you, which I promise will save you failures, frustration, and the overall unpleasant-ness of eating gritty-falling-apart baked goods. These pancakes are not only cohesive, but also light, fluffy, moist and, delightfully pumpkin-y. In a medium bowl, mix together the Pamela's Baking Mix and the cinnamon. 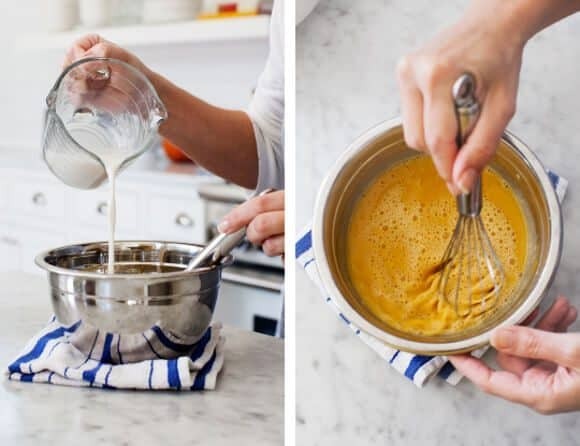 In a smaller bowl, whisk together the pumpkin, almond milk, egg, coconut oil and sugar until smooth and well combined. Pour the wet ingredients into the dry ingredients and use a wooden spoon to mix well. Heat a nonstick pan with a little coconut oil. Scoop the batter onto the pan using a ¼ cup measuring scoop. Cook until bubbles form, then flip and cook a little longer. Both sides should be nicely golden brown. Repeat with remaining batter. 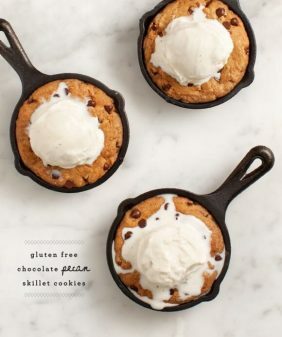 Oh my, those skillet cookies look divine! Would love to try! Well, gluten free or not these DO look fabulous! I am dying to try that pancake mix! Right now those pumpkin pancakes are calling my name! I’d love to try the baking mixes! Personally, I really enjoy Trader Joe’s Gluten-Free Pizza — the crust always turns out nice and crispy. I would love to try making those pancakes, though ! I have a gluten free flour blend from Trader Joe’s that I’m dying to try! These pancakes look great! Yum! My daughter is gluten free so I’ll definitely be trying these 🙂 Thanks for the recipe! My husband recently began a gluten-free diet. I wasn’t a big baker to begin with, but he loves cookies and now that it’s tougher for him to find cookies to buy, I’ve been trying to make them more often. His favorite that I made so far were pumpkin cake cookies! I recently found out one of my dear friends can’t eat gluten, so I’m excited to try out some gluten free cookies to mail to her! I’ve been GF for years, but only recently discovered Pamela’s products. My current favorite (2) recipes to make are an adapted GF/DF version of Martha Stewart’s PB&J cookies and an adapted GF/DF Black Dinah chocolatiers molasses chocolate chip cookies. But I have become a huge fan of Pamela’s vanilla cake mix. My husband (non-GF) swears it’s the best gems had- tastes just like yellow cake-in-a-box, and is perfect for upside-down cakes. It being apple season up here, apple upside-down cake is on our menu regularly. And by gems, auto correct means “he’s”. Oops! Oh man, my all time favorite gluten-free baked good is definitely bananas foster cupcakes… but upon seeing this recipe I suspect they’re going to have some serious competition. 🙂 Thank you so much for hosting this giveaway!! The other morning my boyfriend and I made gluten-free chocolate and pecan pancakes. They were delicious and I’d love to try making them again with Pamela’s! Thanks! I need to make these pumpkin pancakes for the gluten haters in my life! Would love to try out Pamela’s. Thank you for the giveaway and all the awesome recipes! I’m just dying to dry a recipe I was given the other day for Gluten Free Monkey Bread and after seeing this post I’d love to get my hands on the flour mixes you used so I can try these pancakes as well! i love finding out about new products…these look soo fluffy! These look delicious! 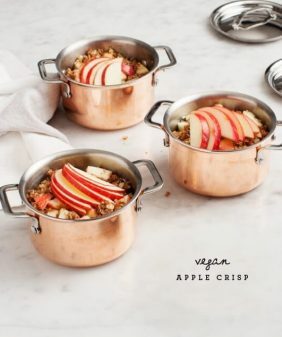 One of my favorite gf recipes is for apple crisp. Cookies are a staple in our house. The favorite seems to be the classic GF chocolate chip. Oooh these look delish! There is a gluten free cinnamon roll recipe I’m dying to try! I’ve been gluten-free for two years and Pamela’s pancakes are the best! Those pancakes look delicious! I love pizza so I’m really eager to try the gluten free pizza dough recipe. I’d love to try out those pancakes! This recipe for pumpkin pancakes looks amazing. Since I do some baking for friends and one of them happens to have Celiac disease, I am always on the lookout for GF recipes that will be safe for her to enjoy and amazing for everyone else too!. My favorite recipe, so far, that I’ve baked has been brownies with Pamela’s GF brownie mix. My daughter said they were the best brownies she ever had. 🙂 I haven’t tried the other Pamela’s products yet, but I would love to! Hello! I live in Boulder and my family from Detroit is coming to visit for Thanksgiving. It’s a difficult crowd, a mix of vegans and gluten free-ers. So I’ve been trying to figure out what I can make that will be an all around crowd pleaser. I will definitely have to try making these for breakfast! Oh these look delish!!! I’m ready to bake gluten free, for myself and my loved ones!! I don’t have a favorite gf recipe, but this could be it! I’ve got to try these mixes, love that they are already combined for me. Can’t wait, it’s pumpkin time! Hmmmm, those look delicious ! Could I just substitute the gf flour mix with whole wheat flour you think ?!? Would love to try them ! I made the banana blueberry muffins and they were delicious! Can’t wait to try out these pancakes this weekend! I’ve heard great things about Pamela’s mixes. Think I’ll give these pancakes a try. Just made pancakes from Bob’s g/f pancake mix and well, yummy, but….these look more exotic and delicious. 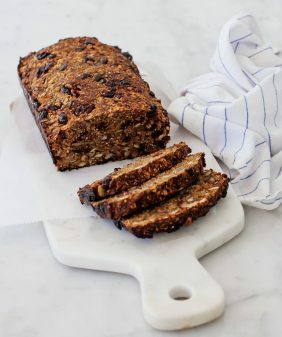 I’ve never baked anything gluten free but would love to try! The pancakes look delightful! I’d love to try this recipe because I definitely have had frustrating times with bad ratios and subpar results. I’d also love to try gluten-free pizza crust or banana bread! I can’t wait to make these. Just learning gluten free stuff, so thanks for the info! This recepie is amazing! I usually don’t like the texture of most panckake mixes but the Angela’s one tops the other brands. I’ll be making more pancakes tonight! Thank you for sharing this gem with the rest of us. OOOPS! Got to excited and wrote the wrong name for the panckake mix. It is Pamela! I very recently became GF so I don’t have a favorite baked good yet, but I would absolutely love to get back into baking with these products! I love, love, love pumpkin pancakes and just this week I started gluten free eating on the advice of my sister. This recipe is perfect timing! I would try these pancakes! My husband doesn’t like most gluten free flour substitutes, so I need to find one he does like. My favorite gluten free recipe? Can’t pick just one. Four of your recipes are favs of mine though. Apple Muffins, Blueberry Banana Pancakes, Skillet Apple Crisp, and Vegan Coffee Cake Muffins. I’ve shared some of them on my blog. Can’t wait to try these pancakes!!!! These look amazing Jeanine! 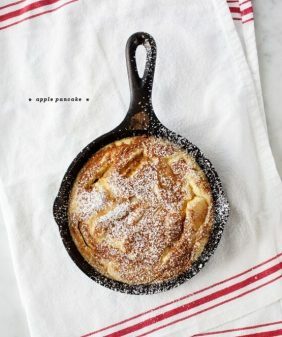 I’m always looking out for a new pancake recipe and this looks perfect for fall! I would so love to try gluten-free scones for breakfast! Lately I just avoid eating and making baked goods most of the time because I’m always intimidated to make them with the barrage of gluten-free ingredients it takes to make them, but I would LOVE to try some of these mixes. The pumpkin pancakes look amazing! Gluten-free muffins are delicious especially with added mixed berries! These pumpkin pancakes look amazing too! By the way, I’ve looked and looked for Pamela’s Artisan Flour Blend but can’t find it in any stores, even stores that carry the rest of her line. I love the baking and pancake mix! It was muffins that I missed the most when I first had to go gluten free and couldn’t find good replacements. I love your recipes for so many gf baked goodies! Wow, I’ll definitely pick up some of Pamela’s Mix on my next trip to the grocery store. My favorite gluten free baked good is usually brownies, but I am excited to see if these gorgeous pancakes tops them! oh these pancakes would be what I tried. I make a gluten free protein pancake but Haney had much luck without the protein powder. Thanks for letting me know about Pamela’s gluten free flour mixes. YUM. It is fall and I am loving all the new stuff in season. I’ve done very little gluten-free baking, but I have a friend who has to eat gluten free, and I’ve promised him baked goods! We want to have a brownie night and taste test a whole slew of recipes. Would love to win this! I am a huge fan of gluten-free sweet quickbreads! My favorite is spicy chocolate gingerbread cookies with chocolate chunks. Lots of spices to liven up the dull taste that GF flours sometimes have. And chocolate, which is never a bad idea. I really like pizza but the traditional dough is hard on me. It would be great to have a tasty gluten-free dough/crust option. Those pancakes look amazing! My favorite gluten free bar is Mrs. Mays cashew bars, I know they are not a baked good, but they are amazing! Wow those pancakes look delicious! My boyfriend is gluten free and I’ve been experimenting with all different kinds of gluten free flours and baking mixes. I would love to try these flours! My favorite creations to date are GF breadsticks stuffed with mozzarella cheese or the GF pumpkin chocolate chip cookies I made a couple weekends ago! Do you think I could substitute almond flour for the Pamela’s flour mix? Also, I got this amazing recipe from one of my friends for gluten free, dairy free, non-GMO pumpkin muffins. I will use almond flour in them and I’m so excited to make them! Thank you! If I could figure out how to make a gluten free chocolate croissant that would be heavenly! They have a recipe on the back of the package that tells you how to use the mix to make crepes. And they are divine w some organic hazelnut chocolate spread and bananas. Or with lemon yoghurt and mixed berries! I love Gluten free food & have been experimenting with many flours. I’ll look for this mix absolutely. Does whole foods carry Pamela’s? I need to find a good recipe for chocolate chip cookies. A bakery near me makes amazing gluten-free oatmeal chocolate chip cookies. I could eat them all the time. Gluten free pumpkin chocolate chunk cupcakes are one of my favorites. This pumpkin pancake recipe is definitely on my must-try list now. I really can’t wait to try these gluten-free pancakes! My two favorite things together! I would love to try the pumpkin pancakes!! Oh, I’m so excited to try this mix. I’ve been hesitant to try anything. I’ll make the pumpkin pancakes first, then try the pizza! I just recently was diagnosed with a gluten intolerance/ allergy. I have attempted several gf recipes and have not been successful. These sound amazing. I am going to give this recipe a try. Thank you!! Regardless of the flour, you have some serious pancake skills. Look at the golden brown! After these, I am definitely going to tackle that fig flatbread. I need to get on the mix bandwagon. I have been sifting coconut flour for too long. I love gluten free pumpkin muffins, I have to give these pancakes a try. Thanks! That would have to be the pancakes! We’ve never been satisfied with ours, gluten-free or no. Hooray, a giveaway!! I haven’t really tried cooking anything gluten-free before. It’s something I want to make a conscience effort to do in the new year (this year, the food holiday challenge I’m on tends to cramp my style a little bit). With that being said, I want to make your fig flatbread. That thing is gorg. Tried these today…added a cup of blueberries. Delicious! I love Pamela’s mixes because, as you said, they are easy to use. My favorite recipe is Lemon Blueberry Muffins made with Pam’s baking mix. Yum! These look great! Excited to try the banana blueberry muffins too. My favorite gluten-free baked good is Korean rice cake – technically it’s made in a steamer not an oven, but the texture is very similar to cake and it’s served at tea houses alongside other cakes, so I consider it a ‘baked good’. I love rice crackers too! I have been been wheat free for years now. I MAKE An ORGAIN CORN BREAD /ORGAINIC CORN MEAL And corn flour also orgain. so help me to make it.becouse i love it.and it looks great. I’ve been gluten free for a bit over 1-½ yrs. And dairy, soy free, eating low glycemic. Lost 85+ lbs & just now beginning to mentally be where I can bake again. I’ve been craving pancakes & now I really want to try these w/pumpkin. Thanks for the ideas. LOve, Love, Love Gluten Free Baked Goods! Any and ALL! Love any and all gluten free baked goods! ALL. Pamela’s baking and pancake mix is soooo delicious. Will try out the recipe with pumpkin in the pancakes! Yum! With Thanksgiving coming up – and trying to keep dishes delicious AND gluten-free this post is really helpful. I will certainly give Pamela’s mixes a try. ooh….salivating right now. Looks so yummy. I want to eat pumpkin pancakes now! Thank you for the chance to win. gluten free chocolate chip cookies – they are an oldie but a goodie and everyone always loves them! I want to make those pancakes! I love gluten-free cinnamon rolls using rice flour/tapioca flour, and a mess of other ingredients. I have had a hard time finding a ‘mix’ that works, but would love to try out these! Gluten-free isn’t an option for me, so finding something that is quicker and tastier would be amazing! Look forward to trying these pancakes! These pancakes look amazing! My mom has Celiac disease and I would love to make them for her. I am a big fan of GF lemon-ginger cookies that I make for her. My favorite gluten-free recipe is that of what I like to call my “everything cookies.” They’ve usually got chia seeds, coconut oil, oats and oat flour (pulverized oats), almond butter, chocolate chips, pecans, almond flour, shredded coconut, cinnamon, baking soda, brown sugar, maple syrup, and vanilla extract, but I like the idea of mixing and matching different spices, nuts, and chocolate types to suit whatever is on hand. It sounds a little complicated, but these are all ingredients that can almost always be found in my kitchen. The best part is that they are not only gluten-free but vegan too! I haven’t made many gluten-free baked goods, but I’m a pancake fiend and these look unreal! I would be super excited to try these mixes. I live for fall, with pumpkin everything!! I would love to make pumpkin pancakes and waffles, and oh, pumpkin chocolate chip cookies!! Dying!! I am looking forward to making the gluten free pumpkin pancakes for my Grandson. He loves Pancakes!!! Gluten free baked empanadas! So tasty and you can’t tell the differnce! Your posts always make me the hungriest! My favorite homemade gluten free baked good has to be Green Kitchen Stories’ oat and ginger crisp cookies. I have been making them almost weekly here and eating the whole batch in a day (they are basically oatmeal, right??). I’ve been diagnosed with gluten sensitivity and other food sensitivites. After almost a half a year of a very limited diet I am getting better and this is a great occasion to celebrate making these wonderful pancakes. Thanks for the great looking post. Can’t wait to taste them. I like making gluten free oatmeal chocolate cookies! Thanks for the awesome giveaway! These look great! I used to be known (by my boys) for my whole wheat pancakes and made them often. Now that they are grown I don’t make them or eat much wheat products at all. But I’d love to try this out. Im a big fan of anything with pumpkin. Thanks for sharing this, I didn’t know about Pamela’s products, and I see they can be found at Whole Foods. The pumpkin pancakes sound wonderful! I am going to share this recipe with my sister-in-law since my niece is having medical issues in which her doctor has recommended she try eating gluten free. My niece is a very picky eater, so any advice on good gluten free recipes and products are greatly appreciated. Thanks for the info on Pamela’s baking mixes and for sponsoring this give-away! Hmmmm. Looks tasty! I immediately thought how I could turn these into crepes and with what to fill them. Should I make them dessert crepes or for lunch? Some cooking creations are brewing. Thanks for the inspiration! my favorite baked good of late has to be gluten free scones. it took me a while to get the consistency right, but i found the right flour and the right amount of butter this week! The pumpkin craze each year turns me off a little… till I start baking. Muffins, breads, and now pancakes! Thanks for this recipe. As for my favorite gluten-free goodie, brownies made with black beans rather than flour — incredibly moist and delicious. Thanks for that recipe anything pumpkin is divine! I love pamelas yellow cake mix on the package is a recipe for coconut cake for the liquid in the recipe i use coconut milk and some coconut extract it makes a delicious cake and i top the whole thing off with seven minute frosting and extra shredded coconut Yummy! I can only find the mix at Whole Foods but I’m asking the store manager at Stop and Shop to order it because they do carry the other Pamelas baking mixes. Awesome Product !!! ohhhh I would love to try this pancakes! my attempts in the past haven’t turned out so great. I love any GF backing and mostly just use almond flour or coconut flour – it’d be fun to try a baking blend and get some other ideas! I have not been too excited about gluten free baked goods. Haven’t tried Pamela’s products, but would like to try. To that end, the pancakes look like a good start. Store bought, my favorite Gluten Free item has to be peanut butter cookies. But homemade, I’ve yet to find the right concoction of flours to make anything other than pancakes. Can’t wait to try these pumpkin pancakes, dripping with syrup. Can’t wait to try this flour mix as well to try and lighten up my recipes! I’ve taken a liking to gluten free baking, because it feels so much lighter and I don’t cringe when I realize I’ve eaten half the pan of muffins. I am rather new to a gluten free lifestyle … about 4 months. I started by going ‘low carb’ – meaning avoiding breads, baked goods, etc, and defiitely see a difference in my, er, digetive system. ‘Nuff said, right? But now I’ve discovered some gluten free snacks – specxifically Glutino pretzels (can I say that i like them better than “real” pretzels? I do!) And the crispy-crunchy GF chocolate chip cookies at Trader Joe’s are OUTSTANDING! Now I’m having serious cravings a sub sandwich at Jersey Mike’s – the #6, to be exact, served “Mike’s Way.” If i could find a soft and chewy roll like the ones at JM’s, I’d be happy. Probably forever. Do you think one of Pamela’s baking mixes would do the trick? This pumpkin pancake recipe is definitely one of my new favorites! 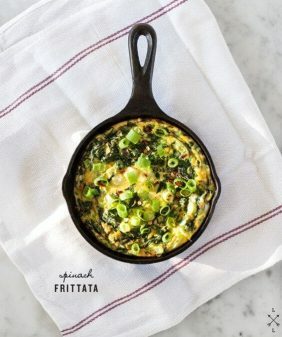 Can’t wait to make this for a Thanksgiving day breakfast to get the day started right! 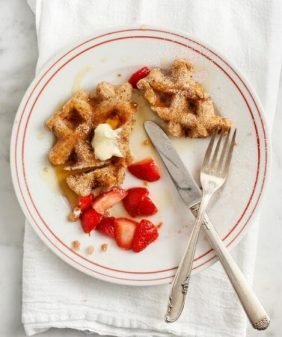 These look like the perfect breakfast! They sound so tasty and delicious, and your photography is stunning. Pinned! My favorite gluten free baked good is from a bakery in Dallas, TX called Tu Lu’s Bakery. Everything there is fabulous and gluten free! But my favorite is their mixed berry muffin’s. These are so AMAZINGLY moist and delicious, that any time I travel there, I make sure to go and get a few to take home. I would love to try to make these pancakes for my mother-in-law. She is gluten & dairy intolerant and I am always trying out recipes for her, some are way better than others! I had the fig flatbread and it was soo delicious… I used a different gluten free flatbread (I was exceptionally lazy the day I made it) but I’m sure a homemade crust would make it exponentially better! Love these, excited to try! What type of pan are you using?? it’s a nonstick Greenpan, but any nonstick pan will work. I am dying to try these pumpkin pancakes and the yummy looking banana blueberry muffins!!!! I found out I am allergic to wheat this year, so it has been a bit of a steep learning curve! My favorite gluten-free products are companies local to my area (Columbus, OH): a fantastic company called Soodles (their coffee cake is UNREAL) and a new bakery called Bake Me Happy which I currently frequent a little too much for my skinny pants’ liking! That being said, I would love to be able to bake more at home! I can not lie, the gluten free pumpkin pancakes are looking pretty delicious right about now. Need to go home and make those since it is pumpkin season. I also made a few orange cookies using GF flour as a replacement for normal. The orange-juice/zest flavored ones. Nom. Whole Foods carries this gluten-free spice bread box mix. You throw in dates and mangos and whatever you want and it is delicious! I love pamela’s gluten free mixes. Great giveaway! I love making “oatmeal” cookies with cooked quinoa. It’s always nice to make gluten free items without a flour substitute. so far my favorite is gluten-free peanut butter cookies, but i’m dying to try the pancakes!! 🙂 pancakes for dinner is one of my favorite treats. I’d love to try gluten-free flour! I found this recipe looking for pumpkin pancakes and I’m so intrigued by using gluten-free. i have not tried pamela’s pre-mixed flours, but you are correct in stating that it is simpler, and generally less expensive, to use mixes instead of buying each of the different flours and mixing them yourselves. i have one daughter who is gluten-free and one who is vegan and the other prefers the paleo diet. when they are all home for a visit, it does require some interesting menu planning! I’ve been wanting to try the Pamela’s mixes for awhile, but they’re not shelf available near me. I love a good GF pizza, specifically artichoke with Sun dried tomato. Oh, man! That is my very favorite mix of all of Pamela’s mixes. I use it all the time. My non-GF family can’t even tell the difference when I use it. My favorite GF baked good is probably chocolate chip cookies. i love coconut flour! great thing to keep around. There is a fabulous pumpkin cornbread muffin recipe from “The Gluten-free Goddess” blog using this exact Pamela’s baking mix that is a long-time favorite. This pancake recipe is going to be a huge competitor! Thanks for this source! I’ve been mixing my own mixes and haven’t been able to create great pizza dough…so I’m excited to try the pizza dough mix! My husband and I are burnt out on french toast so I would love to try this pancake recipe! Your site is gorgeous! You’ve inspired me to put a lot of love and nutrition into my otherwise very average and mundane meals, so thank you! Pumpkin anything coupled with Pamela’s GF flour sounds like a winner but I’m also very interested in trying her corn bread and muffin mix…I’m a huge fan of corn bread! My favorite gluten-free baked good was probably blueberry crumble muffins from edibleperspective. Or cornbread because I love cornbread. Such a lovely Fall post. I have loved Pamela’s products as well ever since my mom went gluten free. My favorite thing to make with her artisanal flour blend is brown butter oatmeal chocolate chip cookies, just to eat the dough half the time and make the kitchen smell amazing! i’m so excited to try those gf skillet cookies AND gf banana blueberry muffins! all your posts have put me in the mood to bake. so glad it’s baking season again!! I was bummed because Trader Joe did not have any gluten free pumpkin pancake mix left. I definitely want to try your recipe. My husband has gluten issues. When my now-husband was my then-boyfriend, we bonded over are shared love for snicker doodles. Then I was told no more gluten. Help a girl out for a gluten free snicker doodle! My husband, on the other hand, could care less, lucky duck that he is. my favorite gluten free baked good is this delish pumpkin muffin recipe made with almond flour! These pancakes are totally stunning. I have to be gluten free, and I enjoy Pamela’s baking mixes so much. May I ask what pan you’re using? It looks line nonstick ceramic, but do you know the maker? Waffles, and chocolate swirl banana bread, and zucchini bread, and….. I recently made a GF zucchini bread, and it was delish! Love your blog. It’s beautiful and so full of inspiration. Thanks! I made these this morning for my mother-in-law and she said, “those are really good.” This coming from a woman who only ever says “that’s not bad” to anything I cook. They were delicious. Thanks. I went gluten free last year in September and haven’t had a good pancake since. I’m so grateful the drought is over! These pancakes are absolutely amazingly delicious! Fluffy and everything a pancake should be. Thanks for putting pancakes back on the menu! I use Pamela’s flour for everything- cookies, muffins, pancakes, pie crusts, you name it. I spent a long time experimenting with gluten free flours. They always made recipes too dense and rarely baked anything uniformly- even the ‘all purpose’ mixes. I have not used any other flour since I’ve discovered Pamela’s. As a true testament to how great it is I had my parents visit for a few weeks and my mother couldn’t tell the difference. This looks amazing! Does anyone have any recs for using the Pamela’s Mix to make crepes? I’d love to include your gluten-free pumpkin pancakes in a gluten-free pumpkin recipe roundup I’m doing for Parade Magazine. 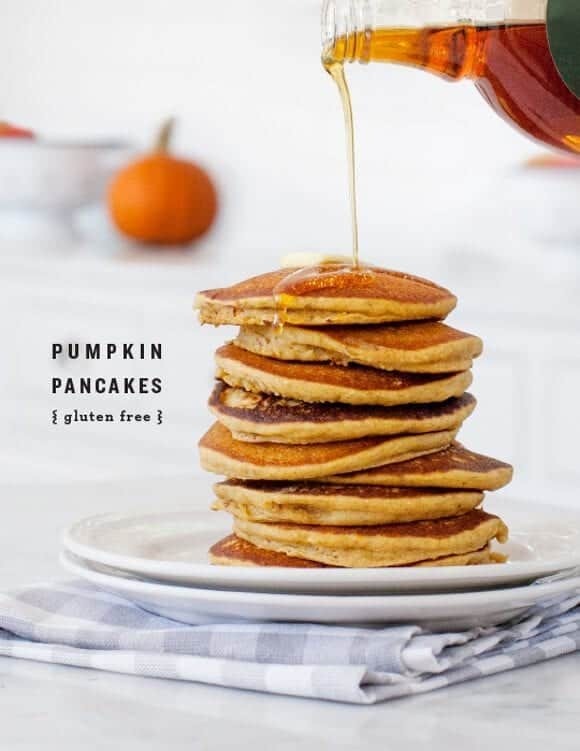 If you’re fine with that, could I use one of your gorgeous photos with a link back to your original post (http://www.loveandlemons.com/2014/10/24/gluten-free-pumpkin-pancakes/)? These gf pumpkin pancakes were delicious! The coconut oil carmalized them a little bit which was a nice touch. I used King Arthur pancake mix. My only complaint is that perhaps there wasn’t enough pumpkin. glad you liked them! If you try adding more pumpkin next time, let me know what ratio! Followed the recipe exactly and the pancakes came out way too thin, thus burning every time. An extreme disappointment. These look amazing! I’m whipping up a batch right now. Thank you for the deliciousness… please never stop. I tried using Namastes perfect flour blend. The batter is SO thick! Pretty much any gluten-free pancake I’ve tried to make is The same way the batter is so thick. Help?!? I made these tonight after a failed attempt at a different pumpkin pancake recipe that would be safe for my son with his allergies. He really enjoyed them! I didn’t have Pamela’s so I made a pancake mix out of the gluten free all-purpose flour blend I had on hand. I also had to use a flax egg because he can’t have regular eggs. Other than that, I used your recipe. Turned out great! It’s nice to come across recipes that still work when adjusted to fit specific dietary needs. Thank your for sharing. Hi Amy, I’m so glad these adapted well! Holy cow! Just made these! Seriously fantastic- best I’ve ever had! Thank you! I also made your amazing oatmeal pumpkin chocolate chips- crowd pleaser! These were delicious! Recently gf, and my daughter loves her gluten…but these were seriously amazing.